Jay-Z crossed #1 off the list a while ago, and it’s now official that he rocks #3 too. 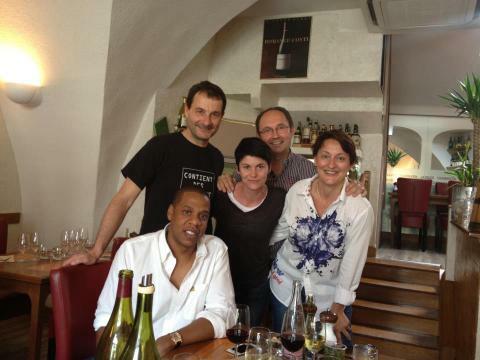 This little pic hit the Twitterverse last week – it’s of Jay having lunch at Ma Cuisine in Beaune, France. Beaune is in Burgundy, home of some of the world’s greatest Pinot Noir and Chardonnay. It doesn’t have any Grand Cru vineyards, but has a bunch of Premier Crus. But we’re splitting hairs here, people, it’s Burgundy! So what was Jay doing there? Alas, he didn’t tell grapefriend. But on Monday he had dinner with Beyonce and Florence (of the Machines) in London and reportedly brought his own bottle of vintage red wine. No word on what exactly the bottle was, but perhaps it was one he picked up at Ma Cuisine? Also, this place is only open on Monday, Tuesday, Thursday and Friday. Making “4-day work week” #4 on the Baller List. Tags: burgundy, chardonnay, jay-z, pinot noir. Bookmark the permalink. Previous post ← fireworks – now drinkable!